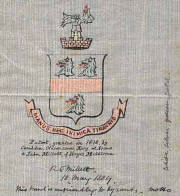 The Family Tree of "Millett of Bosavern"
Traces the Family Tree of "Millett of Bosavern" from Cornwall to New Zealand, from Christopher Millett (died about 1700) to the present day. The Family Tree of "Millett of Marazion"
Traces the Family Tree of "Millett of Marazion", in Cornwall, from Peter Millett (died 8 June 1615). Shield: Argent a fess gules between three dragons' heads erased vert. 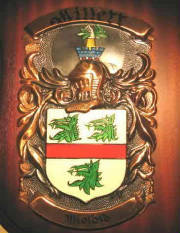 Crest: Out of a mural coronet an arm in pale, habited or, grasping in a glove argent a dragon's head erased vert. 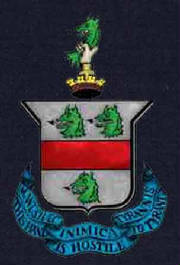 Motto: Manus haec inimica tyrannis : This hand brooks no tyranny. 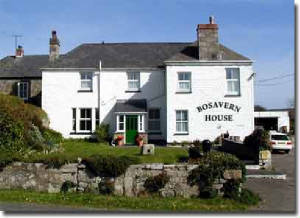 Built in 1625, Bosavern House was owned by the Millett Family from 1669 to the mid 20th Century.